We don’t always replace infusion set and refill the pump at the same time! After issues with lipohypertrophy (essentially fat/scar build-up around infusion sites) a few years ago, I now try to use a new cannula at least every 3 days. But I don’t replace the pump reservoir every 3 days. 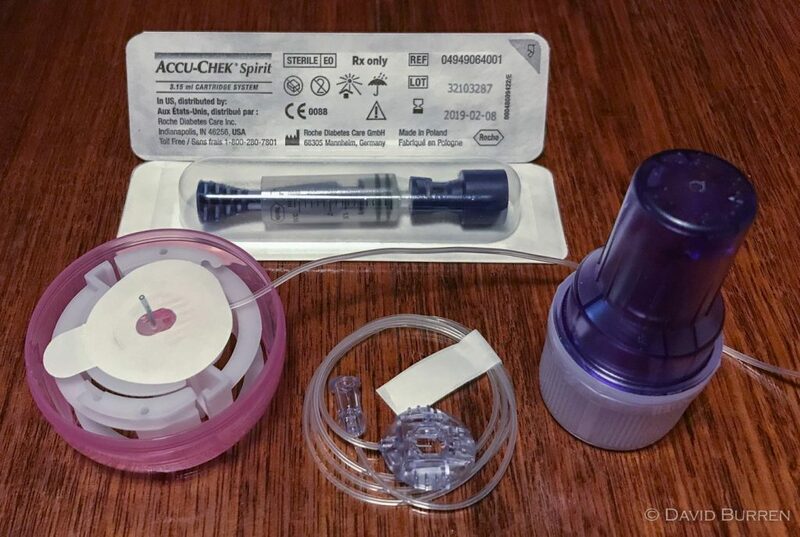 When I started using a pump my TDD (Total Daily Dose) of insulin was usually over 60U, and the 2 ml (200U) reservoir on my Animas pump would last me about 3 days. But today my TDD is closer to 30-35U so 200U lasts me just over 5 days. When using a pump with a 3 ml reservoir (such as my Combo pump with its 315U reservoir) if I filled it each time the insulin would last me 8-9 days, and after that long I would worry about the insulin going “off”. With varying daily totals, I find it’s too hard to fill a reservoir with exactly 3 days of insulin. Instead I tend to fill it with about 200U, and when using pumps with smaller reservoirs (160U or 180U) I simply fill the reservoir. So my reservoir usually lasts 4-6 days. Note that teflon cannulae are rated to be replaced every 3 days, while steel cannulae (such as the Sure-T, Rapid-D, OrbitMicro, and Contact Detach sets) are rated to be replaced every 2 days. If you use cannulae for longer you run the risk of developing subcutaneous lumps and scar tissue which can affect future insulin absorption. But this damage builds up slowly over time, so I think it’s easy to be fooled into thinking the issue doesn’t affect you. After my insulin requirements dropped a few years ago (largely related to a change in diet) my Animas reservoirs started lasting longer than 3 days, and at first that meant I left the cannula in for longer. Without me putting my finger on the cause, gradually I had more and more-frequent issues with blocked cannulae. It was only later when I made the conscious decision to restrict cannula use to 3 days that suddenly I had a much higher cannula success rate. I think the instructions about maximum cannula time are definitely worth following (although I rarely use the 2-day steel cannulae so don’t have direct experience there). But we’re trained to go “off-label”! NovoRapid and Humalog are both labelled in Australia to be replaced in a pump after 2 days. But the only people I know who actually do that have TDDs large enough that they empty the pump in 2 days. Everyone else goes longer, but that “2 days” advice can still be seen in the drugs’ CMI (Consumer Medical Information) sheets [NovoRapid, Humalog]. Those sheets also refer to changing the cannula at 2 days (which does line up with the steel cannula guidelines). Note that in the US the FDA labels instead specify that NovoLog (NovoRapid) reservoirs need to be replaced at least every 6 days, and Humalog every 7 days. I generally have Humalog in my pump for no longer than a week, and in varied climates around the world I have not noticed any drop-off in efficacy. Except when working in 40+˚C conditions, where the insulin does get “cooked” after a day or two. Note that both insulins are rated at safe for up to 4 weeks at 30˚C, but the FDA labels instruct you to discard any insulin that has reached 37˚C (body temperature). For several years now I have changed reservoirs when they’re empty (or almost), and infusion sets every 3 days. Sometimes those will coincide and I change them together. But otherwise I will generally replace each when they’re due. And in fact it generally makes each change operation simpler and quicker than when doing a complete change. Efficient procedures for doing this vary between pumps so it can take some experimentation. I’ll mention some of the options I use in future articles.